We [had] been through an education environment where we were told that we live in a completely relativistic society where everything is available to every artist to do whatever they want. […] All certainties are over and all collective strategies are off, and everything is open for question. And as a part of that, images for example become unstable and their meanings become unstable – so [if] we assume this to be a position that you can’t tell the difference between one thing and another, how do things still get decided, how are politics still strategised? How are images still powerful? How do things still progress in a way? When in 1964 Susan Sontag wrote that ‘interpretation is the intellect’s revenge on art’, she could have little inkling of just how brutal that revenge would turn out to be.10 Four decades later, we find a young generation of artists who wish to avoid the grasp of theory. This is not Sontag’s erotics in opposition to hermeneutics, but it does suggest that to drown a work in theory is to risk a negation of phenomena altogether. The work of Cara Tolmie, which spans installation, performance, text and music, provides a powerful case study here. 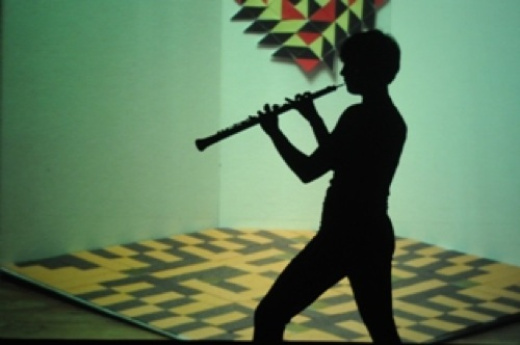 For the performance The End Is a Tumultuous Noise (2010), Tolmie responded to some of Meredith Monk’s 16mm films. The artist created a musical and emotionally intense work investigating the slippage between language and voice and commenting on failed, romantic attempts at transcendence through art. The piece was conceived in two parts, firstly in the form of a mythopoeic text that was handed out to the audience and secondly as a performance in which the artist walked in a circle and, through the use of a looping pedal and a microphone, added layer upon layer of baroque vocal melody at the end of each completed circuit. The echoes in the piece are not of Monk but rather of Beckett. With its minimalist theatricality, repetition and fixed circularity, The End brings to mind his short theatrical work Footfalls (1975), in which a woman paces up and down – ‘revolving her revolves’, as Beckett writes in the stage notes – within strictly confined coordinates while musing on her alienation.11 In response to an accusation of difficulty Beckett replied, ‘I’m not overly concerned with intelligibility, I want the piece to work on the nerves of the audience.’12 The End Is a Tumultuous Noise operates within similar terrain; while multiple interpretations manifest themselves, the work resists reduction to psychoanalytical, political or theoretical analogies. It inhabits a third space in which its own logic is enough. In frame four she explored the space mapped in frame one, this time moving around it in an awkward contorted shuffle and stopping to scream, as she says, ‘like an industrial machine’,13 at each of the four corners. In the final frame she returned to the swivel chair and in the form of a short lecture deconstructed what each part of the performance ‘meant for her’. In this case the work does bring to mind Monk’s statement that: ‘I work in between the cracks, where the voice starts dancing, where the body starts singing, where theatre becomes cinema.’14 Tolmie maintains that each frame ‘re-describes everything that has come before it using a slightly different mode of language and consequently contributing another layer to the narrative and history of this postulated space.’15 There is a constant tension between a demand to suspend disbelief, following Tolmie’s logic, and succumbing to the techniques of alienation. Moreover, the idea of creating a temporary ‘postulated’ space through the voice within the confines of a commercial art fair is a tactic of denial and disavowal. Tolmie’s performance took place outside at the very edge of the fair, where a path through Regent’s Park passes close to the ticket office. This meant that casual passersby could easily view it. Was it acting as advertisement, rebuttal, supplement? How are we to read this ‘postulated space’? In what way does the context mediate its meaning? The artist’s key tropes (looping, translation, layering) were also present on a grander scale for her solo show ‘Read Thou Art, and Read Thou Shalt Remain’ at Dundee Contemporary Arts in May 2011. The title of the show is a play on the Reformation debate on transubstantiation in which one priest famously refuted the notion by saying ‘bread thou art, and bread thou shalt remain’. Tolmie’s work is made in the spirit of a kind of secular faith, in that it seeks a third space outside the divide of knowing or not knowing. In this sense the reference to the Reformation – an attempt to prohibit faith from becoming dogmatic and corrupt – may act as a critique for the ‘doctrines’ surrounding the making and theorising of contemporary art. The show grew out of the desert. Film footage shot from a car travelling through Death Valley in the US, shown on continuous loop, is the first work encountered. This is then reinterpreted in the second piece, a framed, printed list of actions ([fence]post, foreground, post, camera zooms in, etc.) – and then as a framed graphic representation and finally as a 21-minute film or as Tolmie has it, ‘mini-opera’. The works examine how knowledge changes through representation – as if mediated through a game of Chinese whispers. Indeed, in Tolmie’s work, a process or game whereby meaning is constantly shifting through (mis)representation or deliberate guile, this might be as good a description to hang on it as we might find. Homepage image: Cara Tolmie, The End Is A Tumultuous Noise, 2010, performance.